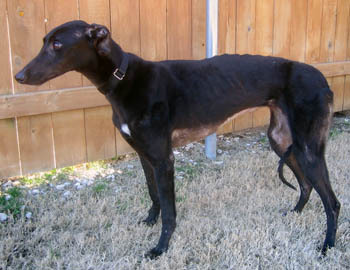 Echo is a 2½-year-old black female born June 26, 2010. Her sire is Dragon Fire and her dam is Flying Mona Lisa. She has no races to her credit. 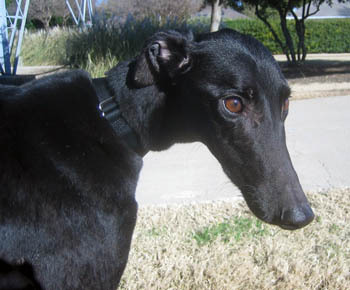 Echo was picked up as a stray off of I35-W and joined the GALT family from the Humane Society of North Texas. She is double tattooed, but we were able to read her original tattoos. Give this little girl a call so she can Echo back! Echo should not live with cats, but does well with smaller dogs. Echo came to my foster home with a bad cold and had a lot of dirt embedded in her skin and coat. To my amazement, she was extremely calm in the bathtub while I scrubbed her skin and coat to remove the dirt and grime. It took about three weeks for her to get healthy and gain some weight. During that time she responded well to living in a home and having a routine to follow. She's even great when it comes to grooming and does not complain during her brushings, nail clippings, and ear washings. She likes to follow me around the house but is not a Velcro dog and prefers to lay on a cushion or rug while I putter around the house. Echo is very food motivated and enjoys mealtimes without counter surfing or being food aggressive toward my other three dogs. However, she is very skilled at picking up stray bits of kibble or other food items that fall to the floor. What makes her happy are lots of hugs and kisses and a nice walk in the evening. It's an especially good walk if she sees a rabbit - which is about the only thing that appears to get her really excited. 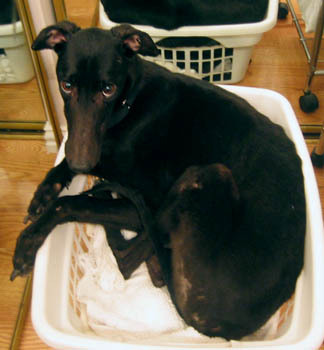 Overall, Echo a very easy greyhound to foster and I know she'll make a very loving pet in a forever home.